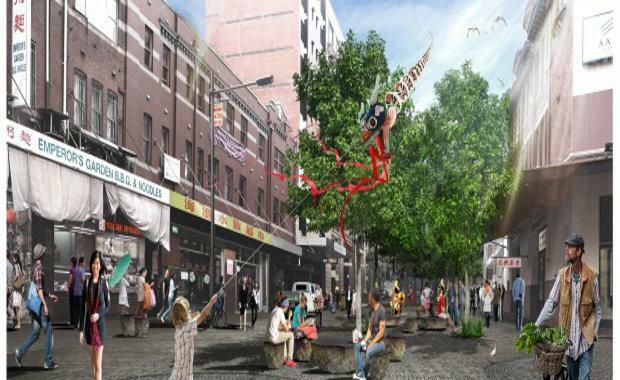 Chinatown Public Domain Plan, now formally adopted by the City of Sydney, will soon join the previous 2012 upgrades on Hay Street, Factory Street and Kimber Lane in recreating the public space to pay homage to Traditional Chinese Gardens and reflect Australian identity. The plan, devised by consultations with people who live, work and visit the Chinatown area, focuses on improving street quality and creating a more inviting and safe public space. City of Sydney Chief Executive Officer Monica Barone, who supports the plan told media, “Chinatown is such an important part of Sydney- so making it a more enjoyable place to live, work and visit by putting people first is an absolute priority”. The plan aims to create a pedestrian friendly culture by implementing wider footpaths and timed lane closures as well as revamping the image of Chinatown with aesthetic improvements such as better street lighting, more street furniture and permanent and temporary art. Sydney Media, “the City is creating a more interesting public space and improving pedestrian amenities to further enhance Chinatown’s appeal”. Lindy Lee is set to lead a team of artists and designers in the revamp, combining her Chinese heritage with Australian art to create a unique ambiance. “We’re thrilled to have Lindy Lee, one of Australia’s foremost contemporary visual artists onboard to guide the design of this new public space. “I’m sure Lindy’s bold artistic vision and her dedication to helping us improve Chinatown will lead to the creation of a beautiful space that Sydneysiders and visitors alike will enjoy well into this century and the next,” Ms Barone said. The plan aims to improve the way the public spend time in Chinatown as well as to encourage foot traffic for local restaurants and businesses. “By making it easier to explore the area on foot and creating more lively public spaces, we will attract even more people to the area and support business in and around Haymarket,” Ms Barone said.